A gentle coral slope here descends to around 20 meters. Take your time and keep an eye out for the rarer and smaller species that are abundant here; frogfish, pipefish and stonefish. Getting deeper there are often groups of cuttlefish with their pulsating colour changes and iridescent flashes, the cuttlefish often congregate around the wreck of a small fishing boat here. The highlights of this dive are the vibrant Mandarin dragonets that can be found flitting around the spines of sea urchins. 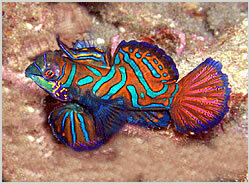 They are named after beautifully coloured Chinese clothing that resembles the colours of this exquisite fish.